Hiking around Tokyo provides a great chance to escape the crowds, unwind and feel some personal space often lacking in the city. While charming scenery is abound there are times you are left scratching head as to what’s really going on. Included below are some of the more unusual scenes that I’ve come to witness on my travels through the Japanese mountains. The summit of Mount Jinba on the Kanagawa / Tokyo prefectural border is famed for a not so subtle concrete horse or as some have suggested something more akin to a giraffe. Funding for this white monstrosity was courtesy of a private railway company. As fish ladders go this is the granddaddy of them all. Located on the upper reaches of the Tama River the Shiromaru Dam fish ladder is the longest in Japan dropping some 27 meters over its 330 metre span. While hikers in Japan on the whole take great pride carrying out their rubbish one notable exception is remnant steel cans and bottles. 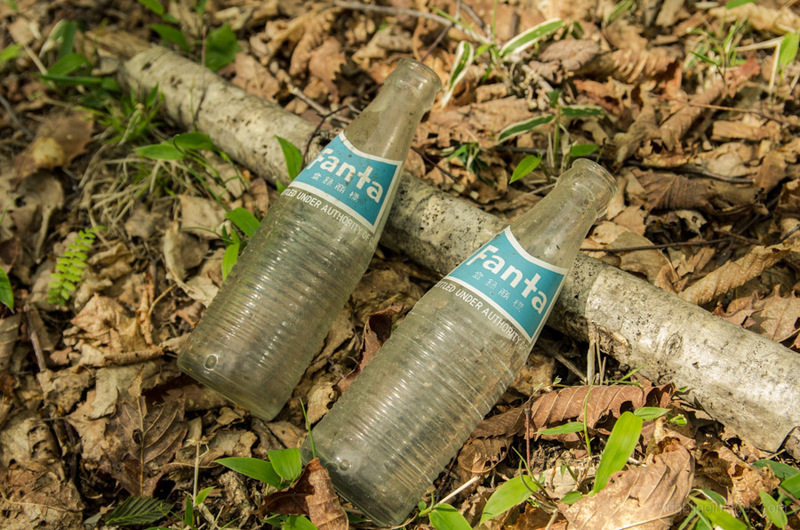 Some lesser used campsites and rest areas are a veritable scrap yard of old bottles and cans spanning from the 70s and 80s which are clearly left to rest. Mount Ioudake one of the peaks which make up the Yatsugatake Mountains sits alongside an enormous volcanic crater. The precipitous cliff walls make for an impressive backdrop and the Honzawa hot spring at the crater bottom is the second highest in Japan. 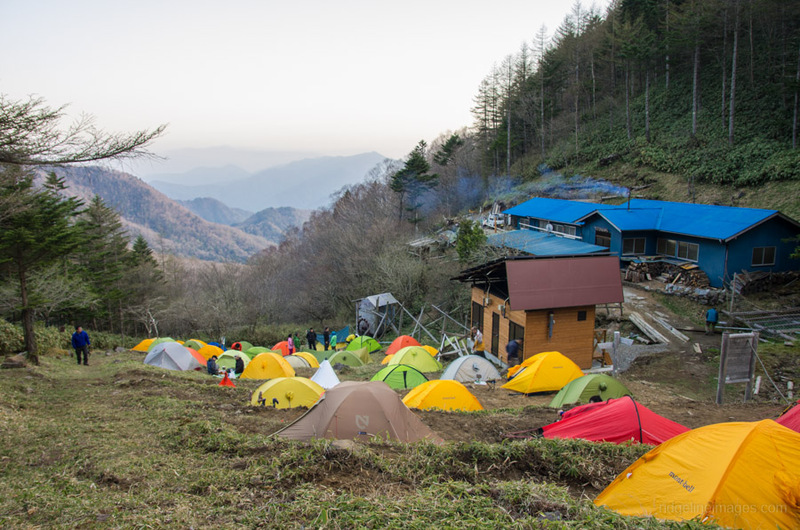 During the summer months the Japanese Alps play host to scores of hikers that make use of numerous mountain lodges dotted across the alpine plains. With some lodges accommodating over a 1,000 guests means a logistical nightmare ferrying in provisions. This need is met through a steady flow of helicopter supply drops which at times makes it feel like you’re hiking through a military installation. The week before this hike up to Mount Takanosu the greater Kanto area was hit by a fairly savage storm leading a path of destruction in its wake. These two unlucky trees appeared to strike its full force. During Japan’s high economic growth period leading up to the 1964 Tokyo Olympics the Okutama Ropeway seemed like a great idea to boost the local economy. Unfortunately the idea failed miserably as alternative access across the lake was sought using newly constructed bridges, thereby negating the ropeway after a few short years of operation. Lurking in the background of this unremarkable breakfast scene appears to be an apparition of a man looking up to the right. At first startling, it was soon realised the figure was just a result of some funky lighting reflected off an old sign and background foliage. The Golden Week holiday in early May means most Japanese share the same extended break together. 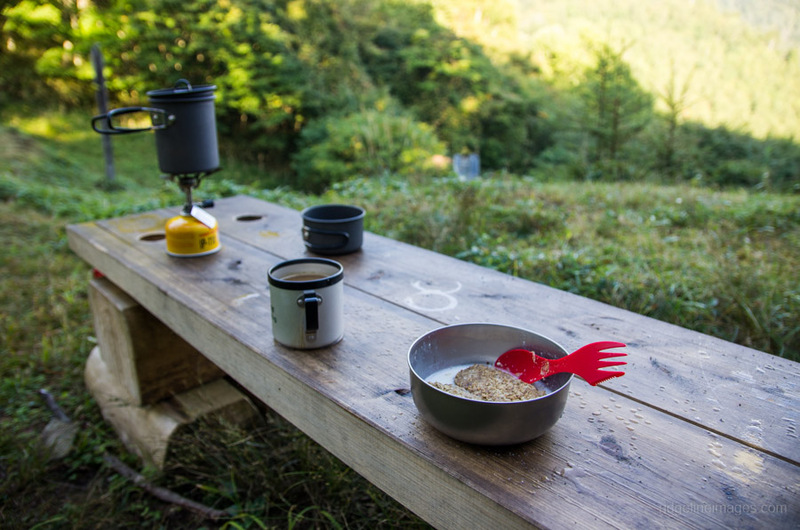 The upshot is an inordinate number of hikers everywhere and finding a place to pitch a tent become a test of ingenuity seeking out any small slither of ground still available. Sika deer normally forage in patchy clearings of forests though this lovely fellow was spotted heading to Mount Kentoku in Yamanashi Prefecture. Looking a tad dishevelled and sporting a matted coat and tethered harness he seemed curious that someone had bothered to stop by.